FOR THE CONDITION CONSCIOUS PURIST! 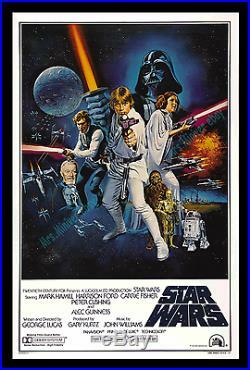 OK - Here it is: A BONA FIDE ORIGINAL : 1977 ROLLED NEVER-FOLDED Star Wars Style "C" RARE INTERNATIONAL one-sheet Movie Poster. Finding a rolled original of this poster is nearly impossible in todays collecting world. Heck, it was darn near impossible back in 1977. How do I know this? Ive been fanatically collecting Star Wars posters since 1977 without a break. Ive seen it all, and, in nearly 40 years of collecting, Ive only seen a small handful of genuine original Style C Star Wars one-sheets that are genuinely in NearMINT ROLLED NEVER-FOLDED CONDITION! This is one of them. That's because FOX only issued these posters FOLDED to the theaters. Only 20th Century-Fox studio executives and Lucasfilm insiders were given rolled never-folded originals. One-sheet or 1-sheet: is a printer's term for what's considered to be the "standard" poster size, which was 27x41 inches back in 1977. As I pointed out, genuine rolled originals of this Style "C" poster are impossible to find, as almost 100% of all the 1-sheet posters were issued folded prior to the 1980's. Nevertheless, I'm not going to go into all the different ways one can to tell the original style "C" from the fakes (I'll save that for my encyclopedia on posters), but I'll point out the two most pressing concerns to most educated collectors. This poster has no hair on Leia's back! I admit my prices may not appear not to be a bargain. I say, "appear" because it's my sincere belief that it's a bargain to be certain in what you're getting. Certainty is what all the fuss is about when it comes to certifications on autographs, baseball cards, and comic books. It's what all three of those collectable industries solely rely on. I'm a well-known expert. I fully designed and authored a Star Wars poster-collecting guide back in 1999 - It was published by Butterfields. I'm credited in the front of the guide. I offer that guide with some of my listings see a photo of it in my listing with the. 1976 ORIGINAL Star Wars Corporation FLYER. I point this out because I want you to know that I can definitely authenticate Star Wars posters with 100% accuracy. THIS POSTER IS THE REAL DEAL. Also, it's important to BEWARE of any dealer who advertises a Star Wars poster as a bootleg. These are greedy dealers who think it's OK to destroy the hobby by circulating bootlegs because they tell you upfront that it's a bootleg. They're knowingly distributing bootlegs for personal profit. It's criminal and unscrupulous. Some poster masterpiece sellers think it's OK because they say they stamp the back as fake. It's again, distributing bootlegs knowingly. That's NOT integrity - that's BUNK! I wouldn't trust them unless they stamped the FRONT of the poster with a mark that clearly states, BOOTLEG! - like they do with fake coins and currencies in that well-established hobby. Help stop this criminality - speak out! CONDITION: As I pointed out above, this one-sheet is TOP NearMINT ROLLED NEVER-FOLDED CONDITION It's at LEAST C9 - Good luck finding a better one! Darth Vader James Earl Jones.... It can crash regardless of any decision you make and can even crash regardless of any decision made by the company related to the stock - Leaving you with a near worthless piece of paper that won't inspire anyone! The magnificence of art and historic documents have an inherent value that relates to civilization and society. This poster is definitely ECONOMY PROOF! Please write with any questions. If you're in the market for top quality original vintage movie posters or Star Wars, then please. 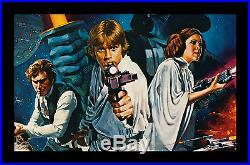 The item "STAR WARS ROLLED NEVER-FOLDED Style C One-Sheet Movie Poster MINT/NearMINT" is in sale since Tuesday, July 17, 2018.